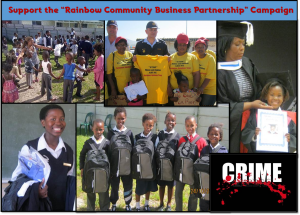 The Hermanus Rainbow Trust (HRT) is inviting ALL of our viewers and businesses in the Overstrand to join the "Rainbow Community Funding Campaign" to help the HRT to provide the orphans, vulnerable children and disadvantaged families living in the Overstrand with HOPE and OPPORTUNITY and to protect them from gangs, drug dealers, rapists while improving their quality of life. The HRT is a leading non-profit Social Enterprise that has been fighting poverty, crime, malnutrition, hunger, premature child deaths and the scourge of drugs in the 5 main poverty ravaged communities of the Overstrand for 18 years. Our 5 main programmes support hundreds of orphans, vulnerable children and disadvantaged families. With the terrible escalation of gang activities, devastating drugs and the associated escalating crime, murder, violence and the abuse of women and children I am appealing to all our viewers and every business in the Overstrand to join the "Rainbow Community Funding Campaign" to enable the HRT to expand our support and services to tackle these problems. For a small monthly investment of less than the cost of a lunch, I am appealing to all our viewers and every business in the Overstrand to join the "Rainbow Community Funding Campaign" which will enable the HRT to expand their 5 comprehensive community and social development programmes so we can jointly tackle these problems. YES I want to HELP ! Please consider making a monthly donation of ONLY R50.00 or more, per family and ONLY R250.00 or more for businesses, for a year managed through a secure Debit Order that will be processed by ABSA Bank. Please e-mail Dave on dave@rainbowtrust.org.za or SMS or call me on 082 896 4345 or call Sharon on 028 312 2748 and we will arrange to meet you with a Debit Order Form that you can fill in and sign.